Managing Sustainable Enterprise is a postgraduate course offered through the Asia Pacific Centre for Sustainable Enterprise at Griffith University. It is a core course in the Graduate Certificate in Sustainable Enterprise, and an elective in the MBA program. The course is offered in a mixed mode intensive format. This means it can be studied online, face-to-face, or some combination thereof. All learning resources are available digitally and easily accessible via the course website. There are no lectures – at least not in the traditional sense – and optional intensive, on-campus face-to-face sessions comprise a series of workshops that take a case-based, problem-solving approach. Throughout the semester, a number of ‘webinars’ are scheduled for ‘Q&A’ sessions on key concepts and theories presented in the course content. Whether studying predominantly online, on campus, or a combination of both, there is an expectation that learners will participate regularly in online discussion through a private social network hosted by Yammer and a group blog on the WordPress platform. Indeed, this constitutes part of the formal assessment for this course. In terms of content, the course is very ‘real world’ and there is a genuine concern to provide participants with the skills, knowledge and attributes to lead and manage a sustainable enterprise. The sustainable enterprise economy includes private, public, civil society and social enterprise and represents a new model of capitalism. It creates wealth for people in the form of economic prosperity, ecological integrity and social equity, and recognises that individuals, communities and investors must gain from the fruits of their labours. Included here are some sample learning materials taken from Module 6 in the Managing Sustainable Enterprise course, entitled: What kind of leadership is required in the transition to a sustainable enterprise economy? The module includes an overview section, four topics, and a summary of learning outcomes. Dr Sandra Waddock is the Galligan Chair of Strategy and Professor of Management at Boston College's Carroll School of Management in the United States. She is also Adjunct Professor at the Asia Pacific Centre for Sustainable Enterprise at Griffith University. An international authority in the area of corporate responsibility and corporate citizenship, Waddock has dedicated much of her career to change leadership as it applies to sustainability. Her 2008 book, The Difference Makers: How Social and Institutional Entrepreneurs Created the Corporate Responsibility Movement, focuses on the stories of 23 pioneering individuals who have been instrumental in advancing an alternative agenda within corporate circles and in creating, what Waddock refers to, as the corporate responsibility infrastructure. Most of them, she noted, were not charismatic leaders and visionaries, but frequently stumbled into their ultimate vision. The common element was that they often took actions based on a personal desire to make a difference, from a deep sense of purpose drawn from recognition of injustice, or a more general desire to make the world a better place. This they did outside of the corporate world, in the space between business and society. Chapter 2 in the book, entitled Building a different future: an emerging corporate responsibility infrastructure, provides an overview of the scope of the work of the difference makers (both those mentioned in the book and others). The prospects of a transition to a sustainable enterprise economy would likely be very slim if it were not for these institutions. Furthermore, as Waddock notes in the video below, sustainable enterprise has entered the space once traditionally the domain of government. Which difference maker(s) do you have greatest respect for and why? Consider posting to the Course Discussion Forum on this topic. The positive deviance concept is thought to originate in the academic nutrition literature in the 1970s, when researchers observed that, despite the poverty in a community, some poor families had well nourished children. Information gathered from these outliers then went on to the form the basis of successful nutrition programs. A broad ranging literature has since emerged that extols the virtues of behavioural and social change based on the observation that, in any community, there are people whose uncommon but successful strategies enable them to find better solutions to a problem than their peers (see, especially, Pascale, Sternin & Sternin, 2010). This happens despite facing similar challenges and having no extra resources at their disposal. These individuals are referred to as positive deviants. The concept has been successfully applied in the field of sustainability by Sara Parkin in her 2010 book, The Positive Deviant: Sustainability Leadership in a Perverse World. A former UK Green Party activist and politician and co-founder the Forum for the Future, Parkin presents an optimistic thesis based on the emergence of 'sustainability-literate leadership' driven by positive deviants. A positive deviant in this context is someone 'who does the right thing for sustainability despite being surrounded by the wrong institutional structures, the wrong processes and stubbornly uncooperative people' (Parkin 2010, p. 22). Parkin discusses some of the key elements of her book in a public lecture she gave at the London School of Economics in 2010. You can download the audio and follow the slides. The talk from Parkin commences at 4:18 and finishes at 45:25 after which there is a Q&A session. 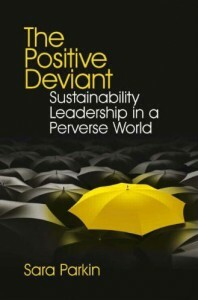 For a succinct overview of the key ideas behind positive deviants and their impact on sustainability leadership, read the introduction from the book, 'Positive deviance: A 21st century revolution'. Are you a positive deviant for sustainability? Do you have something approximating a mental checklist like the 'four habits of thought' Parkin talks about on pp. 9-10? Share you thoughts and reflections with your peers on the Course Discussion Forum of the Course Group Blog. Paul Hawken is a well known environmentalist, entrepreneur, and author whose work has included starting up sustainable enterprise, writing about the impact of business on living systems, and consulting with various heads of state and CEOs on economic development, industrial ecology, and environmental policy. His full bio at paulhawken.com is well worth a read as it provides a succinct overview of the broad scope of Hawken's work over the course of his career. His 1993 international best seller The Ecology of Commerce -- updated in 2010 -- is arguably his best work. Hawken's stirring commencement speech at the University of Portland in 2009 provides much of the material for the Preface in the updated version. Natural Capital (1999) and Blessed Unrest (2007) are also hugely important publications within the academic literature on sustainable enterprise. You are strongly encouraged to read the second chapter of Blessed Unrest (which outlines the central thesis of the book). In summary, Hawken argues that a vast, world-changing 'movement with no name' is now forming, driven by a fundamental change in understanding about our relationship to nature and each other, in response to escalating ecological crises and human suffering. This movement comprising a myriad of social, environmental and community groups is united not by ideology but ideas; among them the reinvention of market-based economics, the need for localised economic control, and radical transparency in politics and corporate decision making. Those that choose to ignore this movement will do so at their peril. Paul Hawken is a very inspirational character, and his unbridled optimism is infectious as can be seen by the audience's response to his speech at the Bioneers conference in the video above. There is no doubting his individual passion and personal conviction which are essential prerequisites for effective leadership in the sustainability field, but a review of Blessed Unrest drew a fairly predictable response in the New York Times. While the author is not overtly critical of Hawken, he notes, 'The movement, most importantly, is very lowercase, its sensitivity being its great strength and, naturally, its tactical weakness. Do-gooding will always have a perception problem'. He concludes by saying, 'Hawken, it seems, is hoping for a miracle, which by definition is possible only because it’s impossible'. Do you think the book reviewer is making a fair point? Or is Hawken correct in his belief that 'the movement' is currently a strategic blind spot for the corporate world? How will business leaders master this challenge, if they need to at all? Share your thoughts and reflections in the Course Discussion Forum, or consider writing a longer piece in the Course Group Blog. No discussion on leadership in the transition to a sustainable enterprise economy would be complete without reference to the late Ray Anderson, the former CEO of Interface. His obituary in The Economist published in September 2011 provides a succinct overview of the man and his mission. The introductory chapter authored by Anderson, Envisioning the prototypical company of the 21st Century, that appeared in Waage, S. (ed) (2003) Ants, Galileo and Gandhi: Designing the Future of Business through Nature, Genius and Compassion is a frequently cited resource on sustainable enterprise, and provides a detailed account of Anderson's vision. There are numerous Internet-based resources on Anderson and the case study of Interface. The video below is one of many available on YouTube and elsewhere, but this particular clip is one of the better ones in that it also provides some historical perspective. How do you think Interface has fared since Anderson's passing? Has the company lost any of its momentum in scaling Mount Sustainability? How would you assess Anderson's legacy as a leader of sustainable enterprise? Discuss these issues with classmates in the Course Discussion Forum or the Course Group Blog.